A strong start from Lackey, some nice defensive plays from Beltre, Scoots and Pedroia and Ortiz going bridge like it was 2004. I think this is more how Theo and Co. saw things unfolding this year. Winning games 3-1 isn't as exciting as a good 10 run explosion, but for a team that is all about "fun prevention" this is what we get. With that W last night, the Sox pulled themselves back up to that elusive .500 mark. Kind of sad that they're still sitting behind a team from America Jr. but what are you going to do? Schweep tonight would be schweet. 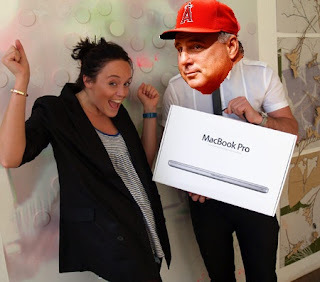 Hey look, it's Mike Sciosica winning a Macbook. Look at how excited he is. And now neck-less he is.